Law Enforcement Assistance Connection, Inc.
L E A C , I n c .
Welcome to the website for the Law Enforcement Assistance Connection (LEAC), Inc! LEAC’s message is my message: To all law enforcement professionals and private public safety experts I am here to serve you and the profession as a resource and support mechanism in helping to address and resolve many of the challenges you face every day. LEAC’s purpose is to support, promote and assist the undying efforts and educate the public about the challenges confronting public safety and the professionals who devote their lives to the cause of public safety. I am a young man whose dream of becoming a sworn law enforcement official was shattered at birth, when I was diagnosed with Cerebral Palsy. Although CP has left me wheelchair bound—unable to serve my community as a sworn law enforcement officer—I’ve been blessed to contribute to public safety in other meaningful ways. My determination, dedication, and compassion for law enforcement was so great that seven years ago I decided to form LEAC—the non-profit organization that you see before you today. My affection, compassion and continued interest in the law enforcement profession and the brave men and women who serve would not have been possible without the enduring love, support and guidance of my family, friends, and long time law enforcement mentors whom I gratefully acknowledge below. Top of list is my mom, Noreen, and my brother Patrick. They’ve been beside me every turn of my wheels, encouraging me to become successful—not just with LEAC, but in all I do. My mom and brother are driving forces in my success and the success of LEAC. On the law enforcement side, I have many people to thank. The Honorable Johnny L. Hughes, US Marshals District of MD, whom I’ve known since I was 14, has been a true friend, a valuable mentor and taught me how to manifest the professional courtesy and loyalty unique to the law enforcement fraternity. Without his continued assistance and teaching abilities I would not be where I am today. Marc O. Feidler—a long-time family friend since my birth—helped me both personally and professionally to be the successful person I am today. He taught me how to “manage the business and balance the scales.” His motivation is infectious and his unquestionable integrity is a model to us all. His personal and professional commitment to me and to LEAC’s mission is truly a blessing; words fail when I try to describe my gratitude to Marc. Chiefs Neil Behan, Michael Gambrill and James Johnson allowed me for many years to work side by side both as an observer and teacher to the sworn men and women of the Baltimore County Police Dept. The BCoPD served in my earlier years as a springboard and learning tool regarding the inner workings of the law enforcement profession, police policies, community policing, and other related areas. Their consideration, understanding, teaching methods, and willingness to recognize and acknowledge my true skills and abilities helped me truly feel like a respected member of the professional law enforcement team. I also thank Chiefs Charles R. Press, Carlos Noriega, and James Scarberry for teaching me about the true meaning of the law enforcement profession—that in spite of the red tape and governmental bureaucracies it is possible to lead by example… That it’s not always how great you do your job but rather the professionalism and commitment you bring to serving your community that matters. These men have shown me through their personal actions that it’s possible to set a premier example for your fellow officers and to inspire those whose lives you touch. Without David Ellin’s professional legal guidance personal friendship and support, LEAC would not be what it is today. His sound advice serves me well as I make important personal and professional decisions concerning LEAC. Jacqueline Konopka has shown me the true meaning of life and inspired me to achieve and overcome personal and professional obstacles. A loyal friend and advisor, Jackie is someone I admire for her perseverance, leadership skills, drive and dedication in all she has done and continues to do. She is extremely special to me—in fact, it’s not a stretch to say that had it not been for her willingness and selflessness to advance LEAC’s goals, this organization would not function nor would this website be possible. Speaking of this website, it’s true that every visionary has a strong marketing and communications team who help translate vision into reality—and communicate that reality to the public. And so it is with my relationship with Bruce Mendelsohn, whom I first met when he worked at the National Law Enforcement Officers Memorial Fund and who has since become a close personal friend—as well as an invaluable advisor. When it comes to marketing, communications and PR for law enforcement organizations, no one does it better than Bruce. For all you law enforcement officers and supporters out there, I thank you for your service and support of this most noble profession. During any crisis—natural or man-made—it’s the people in blue we see rushing in to the danger zone, willing to put their lives on the line to serve the public. There is no more honorable profession. I hope that when you need help advancing the profession and becoming more valuable to the public that you consider LEAC and my professional credentials as a source of help and support. If through LEAC I can inspire you or your staff to seek my professional assistance to help your crime fighting efforts, than together we can make a positive difference. Founder and CEO of the Law Enforcement Assistance Connection, Inc. (LEAC), Terry L. Hunt has for more than a decade worked tirelessly and effectively to advance the cause of law enforcement. His strong relationships with members of Congress, senior law enforcement administrators, and executives from businesses and non-profit organizations that support law enforcement give Mr. Hunt and his supporters access to a national network of corporate, media and political contacts. These mutually beneficial relationships generate concrete business opportunities for LEAC’s supporters. Mr. Hunt has broad expertise dealing with the vital issues and key personnel in law enforcement. From the national level, where he consulted with the White House Drug Policy Office at the Office of National Drug Control Policy (ONDCP) to his work with the International Association of Chiefs of Police and the National Troopers’ Coalition, Mr. Hunt has more than eight years of experience lobbying for law enforcement and drafting legislation that supports law enforcement operations and personnel. A skilled public speaker who powerfully and persuasively delivers compelling messages, Mr. Hunt is a valuable liaison to individual donors, cultivating ongoing relationships and encouraging donor involvement in fundraising activities. He currently manages fundraising and promotional efforts for The Brady Center to Prevent Gun Violence - 2007 Stand Up for a Safe America Gala in Washington, D.C.; The Annual Benefit for the National Law Enforcement Officers Memorial Fund Gala in Washington, DC; the Annual Charitable Golf Classic to support the Law Enforcement Assistance Connection (LEAC) in Essex, Maryland; and A Matter of Honor Annual Golf Event and Gala for the National Law Enforcement Museum in Washington, DC. For his tireless and consistent work on behalf of law enforcement, Mr. Hunt has earned numerous professional awards, including the Federal Law Enforcement Officers Association (FLEOA) President’s Award (2007), State of Maryland Senatorial Citation (2005), Delaware Governor’s Citation (2005), Employee of the Year – Maryland Motor Vehicle Administration (2004), and Outstanding Contribution to Law Enforcement for Baltimore County, MD (1995). Mr. Hunt is an honorary member of numerous police departments, including the Miami Beach PD, the Hollywood, FL, PD, and the Baltimore County PD. 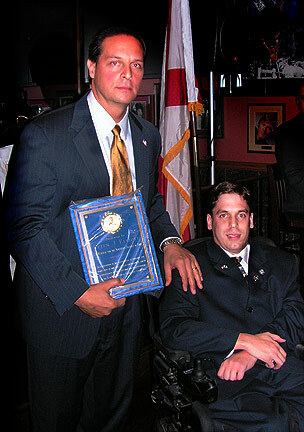 His professional affiliations include memberships in the Federal Law Enforcement Officers’ Association, the National Troopers’ Coalition, the International Association of Chiefs of Police, the American Association of Political Consultants, the National Association of Police Organizations, the Maryland Law Enforcement Officers Association, Inc., the Maryland Troopers Association, the Law Enforcement Executive Development Association, and the Fraternal Order of Police Lodges 4 and 76. He is a graduate of Villa Julie College and lives in Timonium, MD. Service Award to U.S. Marshal Peter Elliott. "Congratulations on expanding your already successful program, the Law Enforcement Assistance Connection. Since you have a passion for the profession of law enforcement, I am not surprised. I remember that as a youngster, no one had more interest and devotion to the business of policing and to the men and women who carry the badge. "You used to roam the halls of Police Headquarters and Precinct station houses offering your expertise to any command that needed it. All looked forward to your generous and helpful assistance. Now, as an adult you are reaching for more ways to contribute and make this a better community and for of all of us a better world. You are and have been an inspiration to me and to many others. Thank you for your service." "Terry L. Hunt, Jr. and LEAC, Inc. are valuable and important partners in my personal crusade to inform and educate the public about the vital role our law enforcement officers perform in our neighborhoods and communities. Through his annual event supporting the National Law Enforcement Officers Memorial Fund, his extensive public speaking engagements, and his broad national network of law enforcement contacts, Terry really champions this profession and the brave men and women who operate the Thin Blue Line."